Somewhere around the 50 minute mark at Anfield, with the Reds trailing 2-1 their star man Suarez went through on goal and seemingly appeared to be taken out by the on rushing Brad Guzan. My instant reaction, watching it in real-time, was penalty, simple. After watching hundreds of replies at different speeds and from every angle imaginable I still hold that view. In my opinion, and it is solely that my opinion, Jon Moss had absolutely no other option but to award the penalty, from his angle, at that speed, there simply was no other choice. The big talking point however is was it a dive? Many of the armchair pundits have made their opinions very clear via the twitter-verse. Lord Sugar a king among these tweeted to say ‘I watched it and he needs to join up with Tom Daley’. 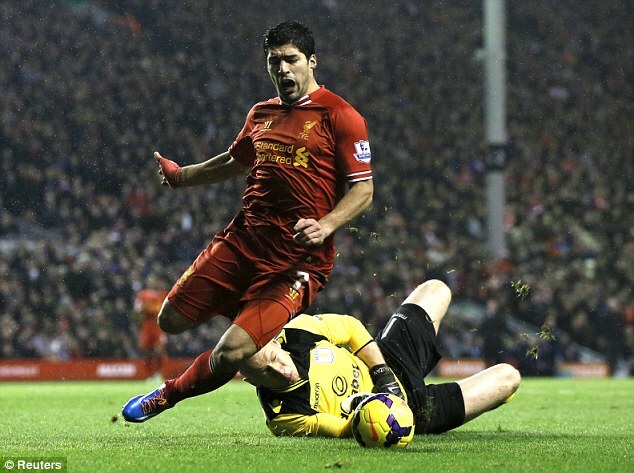 Yet there was contact Guzan’s hand touches Suarez’s right boot. It may be minimal but contact is contact and the very nature of the game in this day and age is ‘if you feel contact, go down’ so can Suarez be blamed for hitting the deck as the on rushing keeper blocking his path to goal made contact with him? No. While watching Match of the day 2 yesterday evening a very interesting point was raised, what the hell was Guzan thinking lolloping off of his goal line towards one of the world’s best strikers and diving at him?! It was only ever going to end badly for him. As I said earlier if players feel contact they will go down, I know that, you know that, has a member of the Aston Villa staff forgot to mention this to Brad or was it a rush of blood I don’t know, maybe he felt he got away with it against Sterling in August why not try again. Another point raised on MOTD2 was that Suarez was simply taking advantage of another player’s mistake, much like if a player were to take a poor touch and be dispossessed, Luis took capitalised of Guzan’s rashness and went to ground after he was touched. I think this is a very valid point, the best of the best as well as dazzling us with moments of sheer brilliance know, more importantly, when to take advantage of a situation and get results. Gone are the days of the big brash centre half that would fly into any situation studs showing replaced, instead, by the twinkle toed European’s that can turn on a sixpence and sprint the length of the pitch with an invisible piece of string tied to the ball and not get caught. Not to say these didn’t exist beforehand but I’d say it’s a fair assessment that the average player nowadays is of a higher ability than ever before. If you ask me I’d much rather see these virtuoso’s than the Vinnie Jones’ of old clattering into everything in their way. Vinnie Jones demonstrating his indiscrimination. I will tackle anyone and everyone. The sport has changed and as the likes of the two-footed tackle are stamped out (I couldn’t resist it) of the game this has opened the door to opportunists who are able to benefit from challenges that once were acceptable. Morally is this wrong? Maybe, but, sportsman aren’t traditionally known for their morals are they. When it comes down to it, it’s a competition and if a player is going to recklessly jump in to a situation will the other, presented with the opportunity to gain the upper hand and potentially help them win, of course they would. Do I agree with diving, no? Diving is different, diving would suggest there was no contact at all. In this case there was and Suarez took advantage of another’s mistake do I see this as right? Every time. This Post was posted in Football and tagged Diving, Football, Issue, Liverpool, Sport, Suarez. Bookmark the permalink.